Colombia fired themselves back into contention in Group H as they took apart Poland, emerging as 3-0 victors. In a night where the losers would be sent crashing out, Poland didn't turn up and goals from Mina, Falcao and Cuadrado made sure Poland would be going home at the group stages of the tournament. Poland saw Jan Bednarek, Bartosz Bereszynski and Dawid Kownacki come into the side for Thiago Cionek, Jakub Blaszczkowski and Arkadiusz Milik, who all failed to help the Eagles earn anything from their opening game against Senegal. Colombia were handed a boost pre-match as key man James Rodriguez was available to start following a hamstring issue. Yerry Mina, Wilmar Barrious and Abel Aguilar were the other three players coming into the Colombian side. With both sides desperate not to lose following opening game defeats, the first 30 minutes saw very few chances for either side, and it took until the 36th minute for the first real chance of the game. Juan Cuadrado's tricky run saw him beat two Polish defenders before Wojciech Szczesny was forced into action pushing the 30-year-old's effort out for a corner. 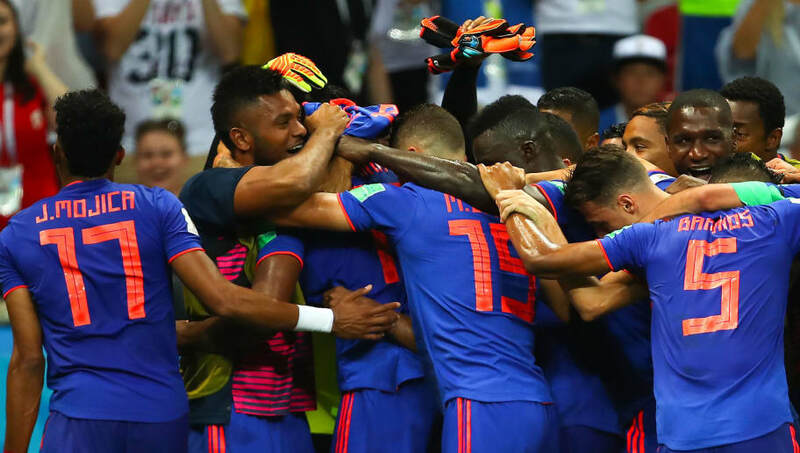 Soon after, the 30,000 Colombian fans inside the Kazan Arena were sent into euphoria as Yerry Mina put Colombia into the lead. A short corner saw an interchange in passing between Quintero, Cuadrado and Rodriguez, with the Bayern Munich man eventually picking out Mina at the far post who headed home past the despairing Szczesny, giving José Pékerman's side a 1-0 lead five minutes before half-time. It was now do or die for Poland as their World Cup campaign rested on their performance in the next 45 minutes. But the first chance of the second-half fell to Los Cafeteros. Cuadrado's poor touch resulted in him having to pass it to Falcao on the edge of the box, and Falcao blazed over, letting Poland off the hook. Adam Nawałka's side were yet to have tested Arsenal's David Ospina until the 57th minute. One long ball caused Colombia problems as Lewandowski raced through on goal, and forced a very good stop out of Ospina, reminding Colombia that Poland can cause a threat. Just as Poland were looking to get a foothold into the game, Colombia doubled their advantage. A wonderful ball from Quintero sent Falaco through on goal, and the 32-year-old made no mistake from close range. Things went from bad to worse for Nawałka's side as a luscious Rodriguez ball found Cuadrado who slotted past Szczesny to put the final nail in Poland's coffin and secure Colombia's first three points of the 2018 World Cup. Ospina was called into action late on as he made a good stop from Lewandowski's long-range piledriver to protect his clean sheet. WHO IS YOUR MAN OF THE MOMENT? The result sees Colombia go one point behind Japan and Senegal, but for Poland it sees them crashing out of the tournament after two disappointing displays against Senegal and Colombia. Poland's last game comes against Japan at the Volgograd Arena on Thursday as Nawalka and company aim to end their World Cup campaign on a high. Colombia, on the other hand, will face Senegal looking to secure a passage through to the round of 16 where they'll face either England or Belgium.